Whether you are crunched for time or money, there are many perks to making crockpot meals for large families. Let’s be honest, who isn’t short on time and couldn’t use to trim the grocery budget a bit? Putting healthy meals on the table is not always simple either! Below you can check out some of my favorite recipes I’ve rounded up. 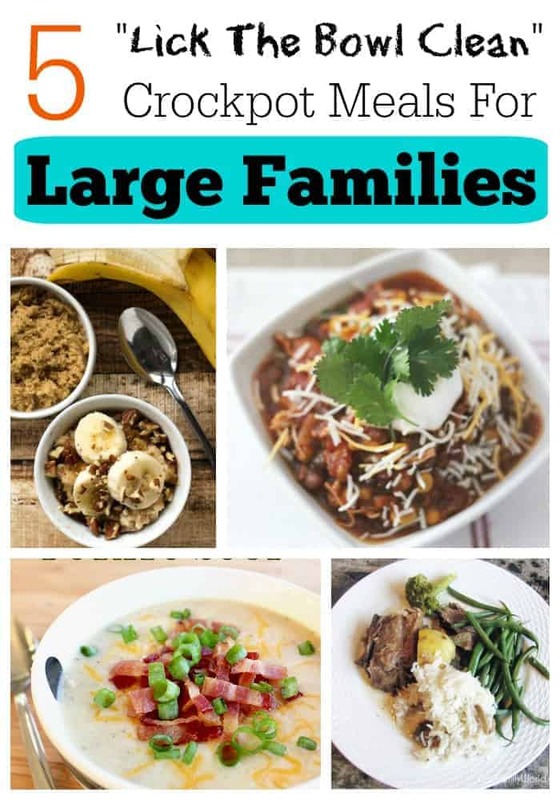 All of these recipes are great for large families and can be made in the crockpot so they are ready by dinnertime. Yum! Do you know any delicious crockpot meals for large families or even larger events? Tell me in the comments! I absolutely love a warm bowl of chili on a cold day. 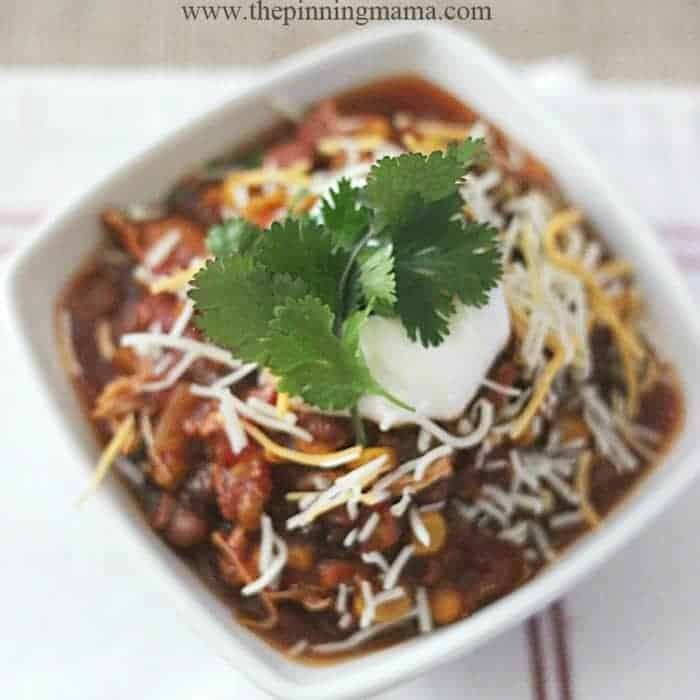 This Super Easy Crockpot Chicken Chili from The Pinning Mama is fast to throw together and one of my favorite picks. Serve chili over rice, salad (taco salad!) or just all by itself. I usually make a big pot all at once, and leftovers are frozen in muffin tins for lunches. Two muffins tins worth of chili is about the right size for a bowl of soup per person, and one muffin tin nicely tops a baked potato. None of this delicious chicken chili will go to waste, your family will be asking for seconds! Mmm, I can almost smell this delicious Beef Saffron And Mushrooms through my computer. This crockpot dinner is super easy to make and makes a lot for a large family. Brown your beef and mushrooms before adding it to the crockpot alongside delicious saffron and broth. 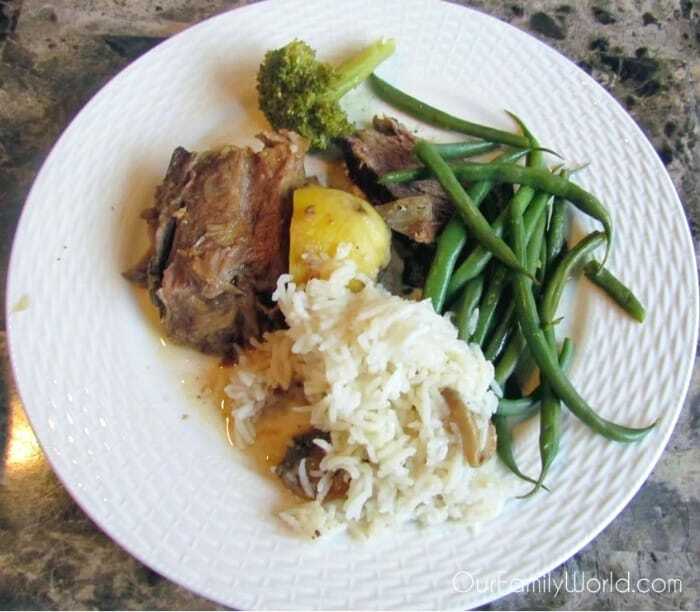 By dinnertime, your beef is falling apart delicious and you only have to make a vegetable and some rice to round out the meal. When you are planning your meals, it is easy to think of your crockpot as the item of choice for dinner. Don’t discount this handy device to have breakfast steaming and ready when you wake up in the morning! If you love the taste of banana bread, you need to try this Overnight Crockpot Banana Bread Oatmeal from I Heart Eating. With the taste of bananas, walnuts (optional! ), and cinnamon this is oatmeal even the pickiest eater can enjoy. I also like that it is a vegetarian meal that includes a balanced amount of protein. This recipe serves 6-8, but could also be doubled for heartier appetites. Yum! Here is a warm and comforting dish that is sure to become a family favorite. 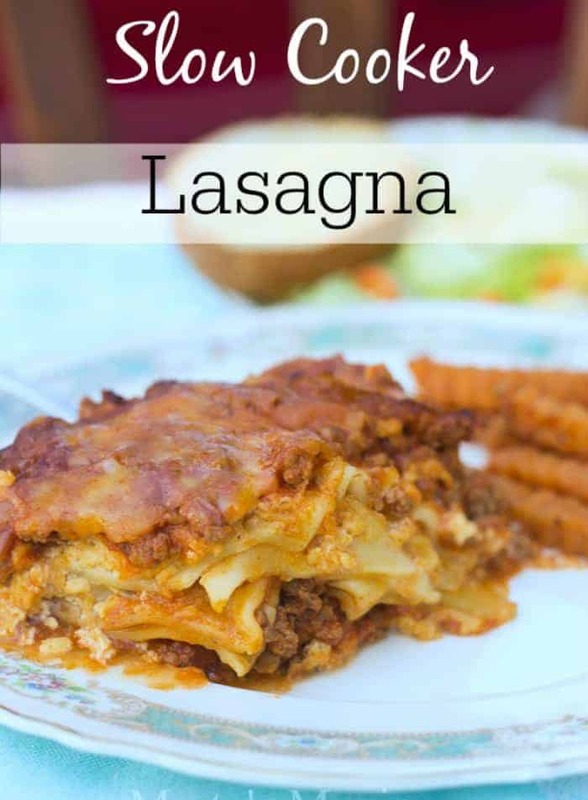 Try making this Crockpot Lasagna from Marty’s Musings. I love that with this recipe you can prepare it the night before and skip boiling the lasagna noodles. I always make sure when I’m layering that each layer of noodles has a layer of sauce either directly before or after it to make sure my noodles are delicious. Try this one paired with a salad, you won’t be disappointed. Every once in a while during the wintertime, I get a strong pull to make Baked Potato Soup, and Happiness Is Homemade brings it home with her crockpot version. She has taken everything that you love about a baked potato and poured it into a delicious bowl of soup. I like to let my family customize their toppings, which makes dinner more fun for everyone. Delicious! 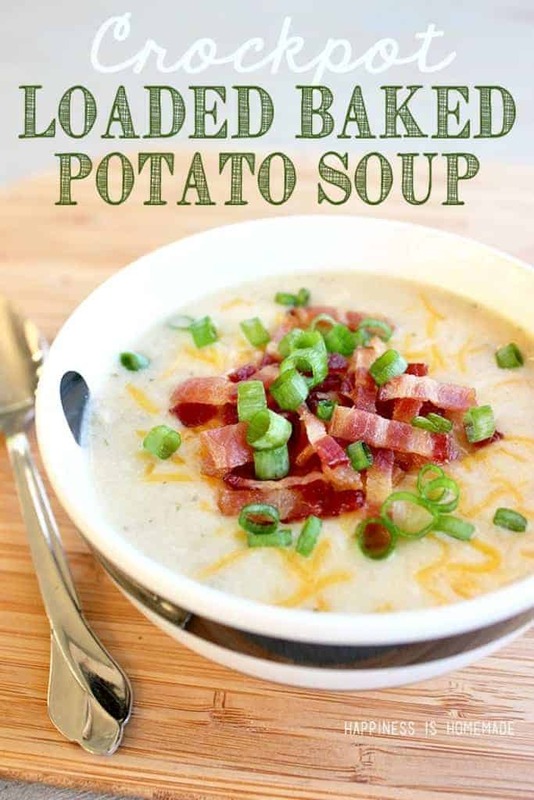 Crockpot Loaded Baked Potato Soup sounds delicious and im sure it would be a hit in my home.I love crock-pot recipes. I love crockpot meals.These look delicious and of course easy too.That’s part of the reason I love them. I love using my Crock Pot. I am always looking for new recipes to try. 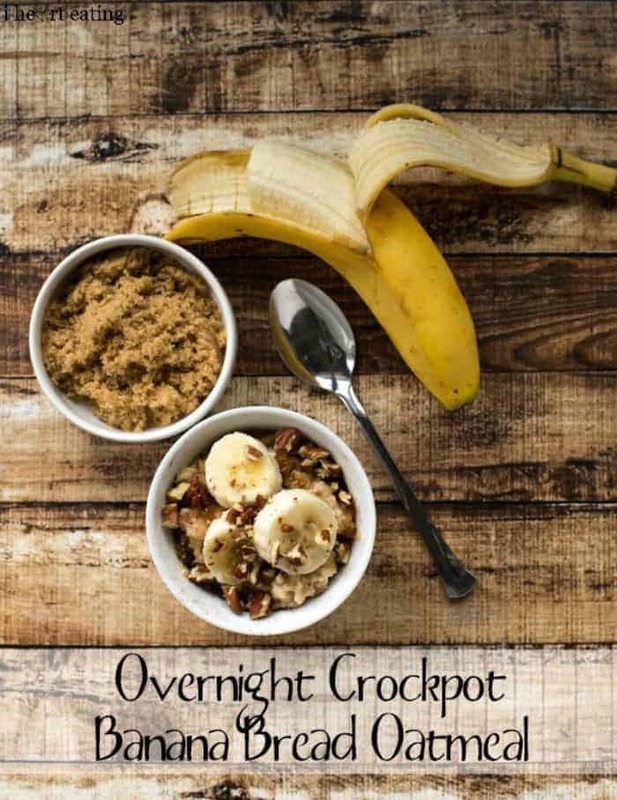 I am going to make the Overnight Crockpot Banana Bread Oatmeal this weekend. This is a pretty good roundup…there are so many recipes out there but these are really great! Thanks for the ideas! NOthing beats a delicious meal on a budget. Thans a lot for these recipes! That banana bread oatmeal looks yummy!! I have been looking for a new breakfast food and this one looks great! I love using the crockpot to make healthy meals for my family. I will be trying the chicken chili and loaded baked potato soup. These crockpot meals totally look delicious! I would love to have any of these for our weekend family dinner. You’ve just inspired me to make potato soup tonight! I love my crockpot and the many MANY different dishes you can make & create in it! Not sure what I would do without it! Thanks for the new recipes to try! Some of these sound really yummy! I love the convenience of Crock-Pot foods when you’re planning on having a busy day but want to get dinner on the table. 🙂 Bookmarking! I make a White Chicken Chili that is similar to yours that is always a hit!! I love using the crockpot on crazy weekday, so we have a great dinner waiting on us when we get home. Well looks like it is lunch time after reading this! That stuffed bake potato soup looks amazing! Definitely pinning for later! Thank you for all these great recipes, I love crock pot meals! I love making dinner in the crock pot. I make it in the morning and let the crock pot work its magic all day long. OK I just love the title that you did for this! It made me laugh. Just from that title alone I know that I want to try all these recipes because they do look delicious. I’ve made a lot of dishes in a crock pot, but I’ve never made lasagna. I’d love to give that a try. Thanks for sharing these. Your Child Has Cancer: Can You Afford It Financially?